The Parks and Recreation Department is housed on the second floor of the Newport Municipal Building alongside the City Clerk, City Manager, Zoning, Public Works and Police Department offices. While staff are frequently out in the field, most administrative business is conducted at our main office including facility reservations, program registrations and finances. During the off season (November - April) reservations for Prouty Beach Campground the Newport City Dock are also received at the Parks & Recreation main office. The City's public gym is located on the main floor of the Newport Municipal Building and is home to several programs and events throughout the year. 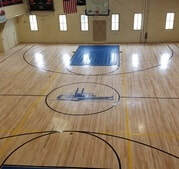 The Recreation Department uses the space regularly for Preschool Playworld, men's and women's basketball leagues, yoga and fitness classes, pickle ball, Veteran's Day celebration, Halloween Monster Bash and much more. When the gym isn't booked for a scheduled program, it's open to the public for recreational use, with permission from the Parks and Recreation Office, from 8:30AM-4:30PM. Community members can also rent the space for private birthday parties, sporting events or activities for a fee. Click here to see the current gym schedule. On the ground floor of the Newport Municipal Building, visitors can find a Community Center with modest kitchen. The space is home to monthly youth programs and an active senior club busy with social, physical and intellectual activities designed to celebrate community. 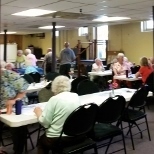 With weekly meals, seasonal outings and games for members 55 and older, the Forever Young Club enhances quality of life for the eldest members of the Northeast Kingdom. For more information or to become a member, contact club President Esther Searles at (802) 754-6642 or stop by any Wednesdays around noon. Dates on this calendar are updated frequently and subject to change. Please call ahead if you plan to bring a large group or use the gym for an organized recreational purpose, 802-334-6345.